Seniors, we know you're trying hard not to cry that the best four years of your life are going to be over soon. Who are you kidding? You should just let it all out... onto your graduation cap! Channel your inner decorista and get your bling on. Unless you're renting your cap and gown, you'll probably be able to keep it after graduation, so why not make it look less boring? 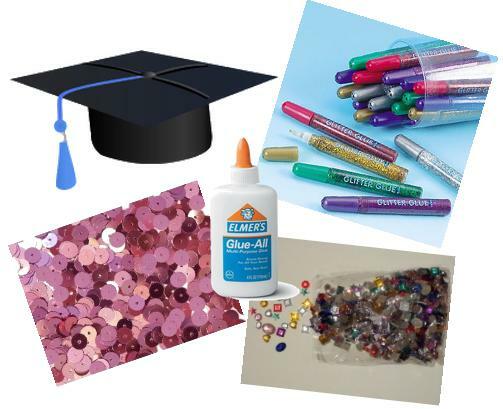 At graduations, I've seen graduation caps decorated with puffy paint, glue on gems, and sequins and they all look like so much fun. It's not only an easy way for your family to find you amidst the sea of plain caps, but it also makes your cap something you'll want to keep in the future. What do you think about this project? Is it fun or just tacky?